The following seven sections of this essay are the summaries of the ‘chapters’ of an essay written in French (and abundantly annotated by schema and concept maps) by Michel Cartier. I have often said to many people that I believe he is the francophone world’s version of Marshall McLuhan. I realize that many people think I am exaggerating and / or am mistaken, and I may be. But I don’t think so, and I am extremely privileged to be able to collaborate with him. In effect, the long form of these chapter summaries represent a significant portion or distillation of his life’s work. He is a master synthesizer and puts his abundant skills to best use in developing visual schema and concept maps which add significant meaning and understanding to his texts. The texts (in French) along with the visual representation can be found at 21siecle.com. The history of humanity progresses by eras, one era after another. Each past era was initiated by an encounter between humans, their environment and new information. Each time that a critical mass of human beings has suddenly appeared on the planet, they have created such large amounts of new information that it became necessary to develop new tools for processing that information and for communicating with each other. And so it is that that over the past centuries there appeared the alphabet, the printing press, the television and the Internet. These are all basically modes of appropriating, transmitting and distributing knowledge. In turn, each time one of these new information and communications technologies (ICT) appears a new culture is created. The new culture re-models or renovates the existing human environment, because each ICT brings us new ways of accessing and understanding our exchanges, ourselves and our civilization. We are now discovering that information literally becomes a form of energy, a mechanism or vector which will ‘inform’ and thus generate a new post-industrial society. In effect, when information is translated into an argument in a given context it becomes opinion. Opinions are a force for change and an agent of transformation. In a post-industrial world information takes on an enormous strategic value. In fact, we should define the value of information in relation to the actions it unleashes. In each era, the forces of the mind have grown, and humans’ brains have become more plastic while the society became more complex. The frontal cortex, the information it processes and the environment in which the processing make up a triangle around which the future organizes. We have just lived through several decades in which we’ve been mainly interested in information technology in and of itself, but it’s about time that we ask ourselves what exactly is information within the emerging context of the new era that has just begun. In the emergent post-industrial society, the new digital form of information is becoming much more than a mere technology. It offers all citizens a ‘collective’ way of life and of taking decisions individually and together. In this context an algorithmic culture is developing which offers a traceability and imparts a transversal, cutting-across-existing boundaries character to information. This culture is modifying databases, the use of search motors, the availability and use of information tools and other aspects of processing information. As well it is becoming the fundamental foundation for a new culture, a new economy and new forms of democracy that are seeking greater openness and transparency. 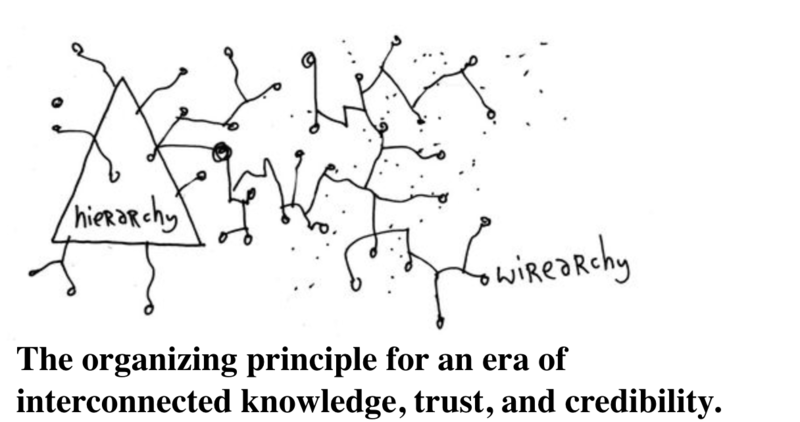 In the emergent knowledge-based society, the Internet is more than a network of IT networks. It is now becoming a planet-wide ‘public place’ which hosts and drives citizens’ expression of needs, wants and desires. It is no longer an information network as in the past, but rather a network of intervention; it is becoming a space of, and for, influence. In other words, it is becoming a space where power is created, distributed and used. The political elite(s) still do not realize that they are no longer trusted by the citizens of the societies they govern. They are also experiencing the first tremors associated with the Internet channeling and aggregating the different kinds and types of anger that are growing all over the planet; these crises are intensifying and being amplified because the elites have not been able to come up with any effective solutions or even any tangible and significant progress. Internet 1 has evolved as expected according to Moore’s Law ( a linear progression which doubles the amount of information processed every 18 to 24 months). With Internet 2 (and eventually Internet 3, the Internet of Objects) Metcalfe’s Law (cubed based on the numbers of users); the impact will be exponential. Not only is the Internet « smart » (in other words interactive, more visual and able to process greater amounts of information), but it will become much more « social ». But there’s a worm in the Internet apple : NSA – PRISM. This act of spying forces all the world’s Internet users to realize that the brute force of digital has come smack up against a force equal to or greater than the force of politics. The manipulations of the American security forces obsessed with control have reminded us that the Internet is before all an economic (and political) tool that they control via ICANN. It is a significant problem and danger that in a world so divided, this network of networks we know as the Internet can be or may become balkanized. Since the arrival (advent) of the first computers 60 or so years ago, most of the analyses carried out have focused on the utilization of information technologies rather than on the use of information. This was a mistake, and today we must re-define how we are going to address and use information in the future; that is to say, how we are going to communicate and create meaning together, how we will engage in sense-making. In the emergent post-industrial society, communication is not a process of one-way distribution, broadcast « out and down » via the mass media, as in the past. It is becoming a much more complex activity that involves (at least) three modes : the broadcasting of television, the narrowcasting of personal computers that carry and circulate specific content, and the point-casting of mobile devices which are based on real-time instantaneous geo-localization. The first mode (broadcasting) reaches the public-at-large, the second reaches specific interest groups in the public sphere, and the third reaches our « friends ». As well, the actual communications process is becoming different from its past dynamics; it is becoming much more personalized. There is an important dark side to this process; the personalized receiver becomes isolated and thus able to be manipulated more easily than ever before. At this point in time, social networks are the object of media exaggeration. This type of florid journalism appears each time a new phenomenon emerges but has not been analyzed adequately. In fact it would be smarter for us to be talking more realistically and with greater care about online social networks, because since the beginning of the species the existence of human beings has depended upon living in human social networks. We must realize (or at least acknowledge) that the current users of online social networks are only groups of individuals who basically only speak with each other, amongst themselves. However, studies now have revealed that groups rarely are larger than 140 – 150 people; regardless of the stretch and reach of Facebook and Twitter, many more people still have their attention, interests and concerns captured by the mass media. As the information provided by the mass media becomes more and more ‘personalized’, the practice of »point-casting » does not add anything worthwhile to the progression of the society in which we live. The real social changes will only arrive with the practice of « narrowcasting », when various groups interact and become capable of establishing common points of view and aspirations based in consensus. We are the sorcerer’s apprentices. Throughout history, we have pried open various Pandora’s boxes : the alphabet, the printing press, the television and now the Internet. Our society see-saws back and forth behind a multitude of screens which seek our attention at all costs. This does and will affect how we create and seek meaning. This signifies that many of us have already submitted to the intoxications of the images on screens brought to us by the marketers of the media conglomerates. Unfortunately, we will live through more and more contradictions of meaning brought to us by the dissonance between reality and what we are offered as reality by the images on our screens. The revolution (in the sense of an accelerated evolution) will eventually be profound. If, during the Industrial Era the analyses of our environments were textual (linear, and detailed and above all controlled by the « gatekeepers » in our respective societies), now we are using communications which are carried out using screens and images. This process offers a relationship and dynamics that become much more personalized and thus much more emotions-based than before. No one really knows what this means or will come to mean to live in a world governed by people communicating regularly by using images. In time, this intensely emotional mode of communication presents the risk of replacing substance in important ways; we may come to live in an environment that consists of little else than sensationalism, misrepresentation and hoaxes. Image-based pictorial representations are becoming so ubiquitous that a new culture of screen-based images is imposing itself over on top of the culture of the written word. For the first time in history this reversal of cultures offers all citizens of the planet Earth a new form of media-based interactive ‘writing’ which is symbolic and personalized. It will modify the entire system and the dynamics of communication between humans. This image-based civilization has already begun the process of conquering hearts, minds and spirits; the citizens do not yet realize the types and extent of the manipulations to which they are being subjected. But tomorrow? And by whom? Our world is not ready for the deep changes facing it : our current stagnation or paralysis may well last another 7 or 8 years because the resistance to the massive and deep changes is till too strong and too well coordinated. The elites who govern our society pretend to want or to lead the changes; however, in effect they are only willing to modify the existing model and do not want to change it as they are fearful of losing their privileges and status. Citizens also want « a change », but not if it involves modifying or changing too deeply their existing habits and lifestyles. It’s likely that we will have to wait for the current crises to play out and exact a significant enough « price » such that a collective clarity makes a real change fundamentally necessary. The powers that be do not rely solely on the laws and the policing of those laws; they depend more and more on acceptance and legitimation by public opinion. The political elits are no longer governing in any effective way; they are only tending to their territory, eyes fixed on surveys and polls. Thus, as a result of globalization, the true power is now in the hands of the economic class which current directs the activities of the planet in a constant search for profits. The voices of citizens around the planet are expressing more and more frequently a loss of confidence in the governing elite, and various forms of anger are surging forth and at times exploding due to the erosion and disappearance of any semblance of a just social contract. The new form of power that is emerging, that of « public opinion » demands that the elite currently in place negotiate with the civil society the re-definition re-establishment of confidence and trust. However, new power(s) could be accorded to the citizenry in exchange for the participation of the citizenry in developing effective solutions for just and equitable governance. The obvious question today is « Are we in transition towards an era of participative citizen-based responsibility? ». In the past, emerging societies borrowed the western world’s model in order to develop and evolve, because they judged that it would help create and sustain « democracy ». Today, with the relatively rapid rise in the prominence of Asian societies, the West is no longer necessarily the default model. It remains the dominant model because of the force and support of the International Monetary Fund, the World Bank and the World Trade Organization. In other words, those who saw the solutions in the American model now see that it is the dominance of the United States that is as much the problem as it is the solution. Thus, there is currently no unique effective societal model but rather several diverse attempts to develop new models on a regional basis around the globe. Two distinct economic models are being developed at the moment. One model is built around security and surveillance, or monitoring, developed during and following the Iraq war, and the model developed around services related to proximity. Experiments in this second model are now in operation around the globe in various regions and communities. Do we have a say in these choices? In the emergent society of tomorrow, it is the citizen who will change the most. Since centuries past, the governing powers of society have been sustained in place by carefully filtering information thanks to the control of the written word. Today, the culture of the written word is beginning to be replaced by a culture based on screens-and-images which, notably via telephones and smart tablets, encourage, enable and impose new forms of media-based communications. For the first time in human history, the citizen has access to tools which permit her or him to express what they think and feel; from simple and anonymous tele-spectator, they can become producers and creators of content. They become agents and actors in the arc of their destiny. The networks of connected communication thus become battlefields upon which are encountered a wide range of many different and contradictory opinions, points of view and belief systems. We have not yet fully understood the scope, breadth and depth of the changes we are facing; the new visual-and-interactive interfaces are being used more and more frequently by Everyman because this new media-based expression is married to humans’ oral communication, their forms and habits of speaking with each other. In addition, the new tools are certainly in fashion today; they have become permanent fixtures or extensions of humans’ ways of communicating almost overnight. We are no longer in the artisan / craftsman (or early adopters’)phase of their use. As experience with their use combines with increased popular anger over betrayals of confidence, these tools will allow the citizen to express their personal visions, which are a combination of opinions, desires and beliefs. These opinions, desires and beliefs are increasingly decentralized and distributed and can become antechambers of action. In the expression of voice by the citizen lies the next great societal revolution. And it will be an accelerated evolution due to the characteristics of all interconnected electronic communications. Access to information and knowledge is becoming more and more personalized and emotions-based. Today, no one knows what that actually means or will mean to live with a much more intense emotionality. The citizen is always at the heart of the final point of any new democratic system; a system which rests upon the citizen’s willingness to participate in a society’s activities (or not). In this new era the new tools for creating information and for its transmission and distribution are rapidly becoming smaller, lighter, more intuitive, less expensive and easier to use. The citizen of the 21st Century will therefore acquire new political and economic power(s) in exchange for her or his participation, because without the participation of citizens there will not be any real changes when facing the coming crises (which it seems clear the existing political and economic elite will not be able to address effectively or resolve). Tomorrow, citizens will have to negotiate and claim their personal digital identities. In exchange, participation in society’s activities and governance will demand of the citizen a significantly greater level and exercise of responsibility for themselves and towards their fellow citizens. We’re all in this massive shift together .. whether we like it or not.